The BLACK BEETLE Lands at Dark Horse!!! Flash Gordon and Lion Men! It's a Western Friday with Lone Ranger! Chills, Thrills, and Fear... From The Deep! The Abyssal Horror "FROM THE DEEP"
So I give you "DR.FREEZYLL AND MR.ICE", A Chilling Tale of Horror! Francesco Francavilla Unleashes The Black Beetle! Adding an exciting new layer to Dark Horse Presents, Dark Horse Comics is proud to announce a new three-part story by New York Times best-selling artist for Batman, and current Captain America artist, Francesco Francavilla: The Black Beetle! As you know I am a HUGE fan of HPL, so you can imagine how thrilled I am when I get involved with books that are about Lovecraft or inspired by him. In this case I was invited to do a cover for the volume 2 of THE LOVECRAFT ANTHOLOGY, a wonderful book published by SelfMadeHero. The book, “A sublime selection of Lovecraft’s greatest tales of cosmic horror”, is edited by Dan Lockwood and includes graphic adaptations of H.P. Lovecraft’s short stories like: ‘Pickman’s Model’, ‘The Festival’.‘The Picture in the House’, ‘From Beyond’, ‘The Nameless City’, ‘He’, ‘The Temple’, ‘The Hound' and 'The Statement of Randolph Carter’. The lineup of amazing creators includes: Jamie Delano, Steve Pugh, Simon Spurrier, Matt Timson, Ben Dickson, Mick McMahon, David Camus, Nicolas Fructus, Attila Futaki, Pat Mills, Dwight Macpherson, Paul Peart-Smith, Chris Lackey, Ade Salmon Bryan, Baugh Chad Fifer and Warwick Johnson Cadwell. The book is titled "LORD OF THE JUNGLE" and will be published by the fine people at Dynamite Entertainment. Here is my cover for Flash Gordon #4, feat. the Lion Men!!! Here's a quick summary of this issue: Flash Gordon and his allies -- the plucky Dale Arden and brilliant Dr. Hans Zarkov -- move closer to a confrontation with the forces of Ming the Merciless. Amid the political and military machinations of Mongo, Gordon faces the ferocious Lion Men, the sinister Shark Men, and a band of rebels commanded by Prince Barin! once again I find myself posting a DARK SHADOWS cover just right after I finished drawing the next issue's one (and once again I can't wait to show that one too). above you can see the cover for Black Panther #529, out in February. This is also my last Black Panther cover for the time being since the series will end with issue 529, which concludes the Kingpin of Wakanda arc, the current arc written by David Liss and drawn by Shawn Martinbrough and Mike Avon Oeming. As mentioned earlier in here, this arc is another great noir, pulp tale of our hero set in NYC so I suggest everyone to pick it up until its conclusion in February. Until then, I'll see you all on the pages of Captain America and Bucky starting in December. 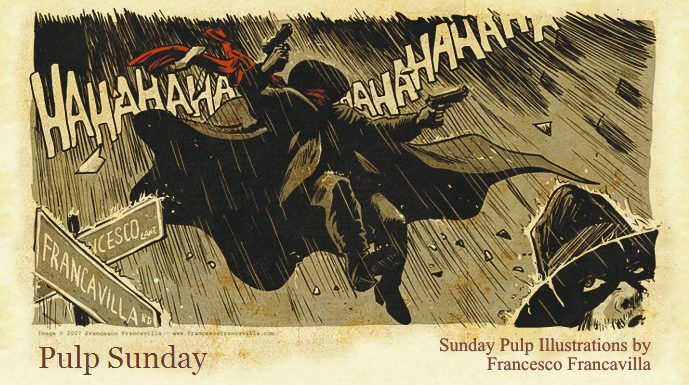 Wish you all a wonderful Pulp Sunday and a HAPPY HALLOWEEN tomorrow! Click on the image for BIGGER CHILLS!!! Crazy busy week, so I didn't have time to finish a new FROM THE DEEP piece (which is in the work) but I managed to do this poster for the zombie-themed (it was my pick this week) Twart. "If you gaze long into the Deep, the Deep will gaze back into you"
Wish youa lla wonderful Pulp Sunday! SPECIAL NOTE: As mentioned, I am not gonna be able to attend NYCC this week (due to work) but for those who were going and hoping to get a sketch from me, pls tune in on my sketchblog tomorrow, Monday 10th, at noon ET: I will be taking the first 10 email requests/reply to my noon post. I will also be picking 2 random after the 10th reply. As you may know, my commissions are temporarily on hold due to a busy schedule, so this is your chance to get some original art from me. Sketches will be fully inked, one character and some bg, on 9x12 bristol board. Pls submit request only if you are resident in US. I am gonna do another round of sketches for international requests later on, before end of the year. Here's some more "FROM THE DEEP". Story is shaping up almost automatically so expect to see it full fleshed out in 2012. Also got lots' of request/emails about the availability of these as prints: yes they are available and if you order in October, you will get a special Lovecraftober discount (and ordering multiple prints will make you save on shipping). Pls email me if interested. For this month, I decided to dedicate all my posts to H.P. Lovecraft, so expect anything that is inspired by HPL or even more direct tribute to the greatest horror writer of all. Below is the solicts for the first issue. The series will be published by Dynamite Enterntainment and I will eb providing the variant covers. Saying that I am very excited about working on such icon is an understatement. Hope you guys dig it and hope you are putting this on your pull-list: Aaron Campbell is drawing the interiors and he has proven to be really good on genre comics like this. Here's the solicits for #2. Inspired by the great Master of Horror, H.P. Lovecraft and his "Shadow over Innsmouth" tale. 100,000 YEARS BEFORE THE TIME OF JOHN CARTER! A tribe of Red Martians attacks the Atmosphere Plant just as it's about to go operational. Meanwhile, the savage Warhoon march on the last stronghold of the Orovar -- the city of Horz--determined to wipe the White Martians from the face Mars. This is the penultimate chapter in the Fall of Barsoom! In between pages, yesterday I put some colors and dressed up a bit the quick B/W sketch of The Swamp Thing I posted earlier. this is the cover for BLACK PANTHER: THE MOST DANGEROUS MAN ALIVE #525, which debuted at SDCC last week. It will be out in November and will be the beginning of a new arc where T’Challa will be facing the Kingpin (Wilson Fisk), Lady Bullseye, Typhoid Mary, and lots and lots of ninjas. Just plain old school pulp/noir fun, which I tried to portray in the above 60s style cover. All titles and icons and types are all hand drawn. BLACK PANTHER #524 - SPIDER ISLAND tie-in, written by David Liss and with art and cover by me, will be on sale in October. The Story: SPIDER-ISLAND TIE-IN! First it was American Panther, now it's…Six-Armed Panther? The arachnid infection griping Manhattan hits T'Challa, but that doesn't mean he'll stop trying to protect Hell's Kitchen! And when Overdrive breaks into the quarantine zone, your friendly neighborhood Spider-Panther swings into a deadly race across the streets of New York City. What has the Spidey villain stolen that's worth smashing through a hero-protected border, and why is the lethal Lady Bullseye trying to keep him from getting back out? Let's start with the cover for DARK SHADOWS #1, the first issue of the mini Dynamite Ent. will be publishing starting in October. Just in time for Halloween Dynamite Entertainment is bringing Barnabas Collins back to comics. The hero of the popular Gothic TV soap opera, which is soon to be a major motion picture starring Johnny Depp that is due from Warner Bros. in 2012, is returning to the four-color world in this new series of Dark Shadows comics written by Stuart Manning and drawn by Aaron Campbell with covers by Campbell and Francesco Francavilla (Black Panther, Swamp Thing). Dark Shadows #1, which is due out in October, will use the likeness of the actors in the classic Dark Shadows show in which Jonathan Frid played Barnabas. TV’s original reluctant vampire, who is laboring under his vampiric curse and haunted by dreams of his age-old lover and nemesis, Angelique, is one of the small screen’s most original horror creations. Manning’s stories for the new comic book series pick up right where the narrative of the original ABC soaper left off in 1971. Barnabas starred in a series of Gold Key comics that were published from 1969-1976 and which are being published in book form by Hermes Press (see “The Complete Dark Shadows Comics”). Innovation published a few Dark Shadows comics based on an ill-fated revival of the show in the early 1990s. Dynamite has wisely chosen to base its comics on the original classic Dark Shadows TV series. Entire Show - HIGH FIVE SELECT POUR AND FINE ART COMBO - available at the Trickster store/event space. THE HIGH FIVE is the specialty “limited edition” beverage of choice for this event: each night, (from Tuesday, July 19-Saturday, July 23) from 8:00 PM until 1:00 AM, we’ll be pouring a unique and highly praised beverage into a custom screen printed TR!CKSTER HIGH FIVE glass and handing it to you, along with a very limited edition original art print. 10-11am SIGNING at Marvel Booth #2329 - bring your Black Panther books or Man Without Fear posters by and get them signed! 2-3 pm SIGNING at DC Booth #1915 - bring your Detective Comics issues by to get them signed. Or how about issues of last year's Garrison miniseries from Wildstorm by Francesco and Jeff Mariotte? He'll sign that too! Directly across the street from the convention center. Wine will be served!!! Also, I'll have prints on sale at the Trickster store during the entire show. Whether you work in single panel illustration, poster design, web design, or sequential storytelling, you more than likely juggle the concept of developing a “style” versus creating immortal visual art that communicates readily with an audience. Technique, theory, method, and madness will all be on display in an intimate workshop environment. Explore paint application and aesthetic, discuss ink and inking implements, and watch as original art is produced on the spot in a variety of styles and media. TR!CKSTER and The Criterion Collection have joined forces to curate a one-night-only celebration of the works of legendary director Akira Kurosawa. This intimate show, curated by Criterion designer Eric Skillman, will feature original pieces by artists from the worlds of comics, animation, and illustration, including: Mike Allred, Scott C., Josh Cochran, Francesco Francavilla, Robert Goodin, Victor Kerlow, Ted Mathot, Scott Morse, Sho Murase, Yuko Shimizu, Bill Presing, Jim Rugg, Bill Sienkiewicz, and Connor Willumsen. Though the gallery show will be free to enter and enjoy for the general public, all proceeds from sales of these works will be donated to the Japan Society Earthquake Relief Fund. This is a special engagement gallery event, existing for one night only: Friday, July 22, 2011. The sollicitations from Image for October releases are out so I can finally reveal one of my most recent covers I worked on and a foray in one of my favorite genre: the HORROR. Also in October from Image it will be released the PIGS issue #2 with my cover (see below). Hope you guys dig it and tune in tomorrow for a full SDCC schedule: I will be attending the show and the TRICKSTER fest as well and will have exclusive prints for sale. A random act of kindness can be damning. When a man witnessed the ruthless beating of an innocent woman, he rushed to help her and was brutally murdered for his trouble. Now driven by revenge, sorrow, and guilt, the woman enacts arcane forces to resurrect him. From out of the earth he'll rise, a twisted, worm-riddled monstrosity forced to carry out vengeance to maintain whatever life he has left, all while confronting the unimaginable truth of his new, hideous existence. Is he forever damned to be a rotting monster driven by an insatiable bloodlust...or is it possible to shed the curse and return to normal? The torment belongs to the living nightmare they'll call Fleshdigger. God help anyone who gets in his way! A couple of days ago the Shuttle Atlantis took off for the last mission of the Space Shuttle program. Being a huge fan of this NASA program (and of the Shuttles) and being also a huge fan of Bond (an old aquaintance for our Pulp Sunday blog) I thought to tribute the last mission with a classic Bond movie: MOONRAKER! All images © 2011 Francesco Francavilla. Hope everyone is having a wonderful and safe 4th July celebration. As promised, here's the second Twilight Zone triple feature with the classic episodes "The Invaders", "Nick of Time", and "Nightmare at 20,000 Feet". And this is it for now, hope you guys enjoyed it. Have a great pulpy holiday! I am buried in deadlines (between Detective Comics and Black Panther and a bunch of new things you PULP afecionados are gonna love it :)) so, in the spirit of SyFy, I am re-running the pisodes of Twilight Zone I did some time ago. Here is the first triple Feature: "Eye Of The Beholder", "To Serve Man", and "The Dummy". Happy CANADA Day to all my Canadian friends!!! Hope you guys dig it too as much as I do. General Van Tun Bor leads the survivors of Thark on a perilous exodus across the Red desert. The once proud race of Orovars are reduced to the survival of the fittest as the tide of barbarism begins to sweep across the face of Barsoom. At the Atmosphere Plant, Scientist Tak Nan Lee and the Red Martian Anouk face unexpected danger from Anouk's own people! The tale of Barsoom set 100,000 years before the time of John Carter continues! I am part of the new creative team, along with writer extraordinaire Scott Snyder and supertalented artist Yanick Paquette, behind the re-launch of DC's SWAMP THING in September. We are adopting the same formula used in Detective, with Yanick taking care of the main story and me alternating art chores with him on issues that will tie in with the main story. This is shaping upt o be quite a cool story, can't wait to get it all wrapped up and ready for you to enjoy.